See the candid pictures of our guests submitted to "Ancora del Chianti Photo Contest"
We look forward to welcoming you to Ancora del Chianti sometime soon! "Cara Laura e Valentina, avevamo bisogno di sfuggire alla vita frenetica e ad un'estate lavorativa e molto impegnativa e, seppure per poco tempo, qui da voi ci siamo riusciti!! Grazie per la vostra ospitalità e cortesia, i toscani saranno pure musoni, ma alcuni di loro sono il TOP!!" "Dear Daniela and Alessandra, thank you so much for the nice holiday here. Thanks for making our stay perfect. Everything was nice and clean, you were very nice and friendly everyday. Thanks for the good coffee too. Dear Laura and Filippo, thanks for the nice stay we had here. Everything was very fine, clean and nice. We really enjoyed everything and go home relaxed." "Stunning light...stunning hospitality! We always want a little adventure when we travel...and to also feel at home where ever we go...Ancora Del Chianti provided me with the comfort, freedom, relaxation and extraordinary views of the region. I couldn't have been happier to have discovered this BnB! The accommodations are very comfortable and they provide you with extra special goodness with the toiletries...made from the region, The pillows were perfect! The lines, soft...best nights sleep I've had in a long time! I also appreciated having the community kitchen. I prepared meals from the sauces and pasta they offer and certainly enjoyed Filippo's chianti! Their staff feels like family. Preparing a delicious breakfast every morning...and a daily special cake! Incredible. Laura, Filippo and the extended family offer you just the right amount of attention...being there when you need them, but also giving you the freedom of privacy and space. If you are a painter....WOW! They have the views you dream of. A writer...it couldn't be more serene. It's all and all a perfect place to land. To explore. 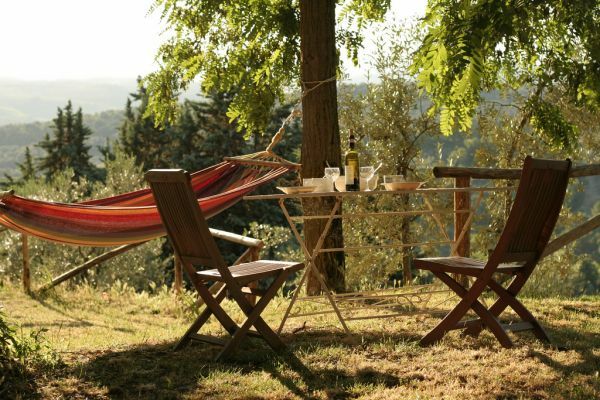 To have as a home base for traveling to the villages around Chianti. Or just to exhale and enjoy relaxing in one of the many hammocks around the property. I can't wait to return! Book it. you will thank me! Trish Land"
""Beautiful place, wonderful hosts!" A great place in the countryside of Chianti with the most spectacular views..absolutely breathtaking! A perfect spot to make day trips to Florence, Greve in Chianti,Lucca, Montepulciano,San Gimignano,and other Tuscan gems. At Ancora we were treated to wonderful breakfasts .Our host Juliana,was very accommodating and so pleasant. If we return to Tuscany again we would be sure to book here again." "En perfekt plats som bas för utflykter i Toscana. Att få starta dagen med frukost på altanen och senare komma tillbaka och koppla av efter dagens upplevelser, bara slappna av och njuta av utsikten och lugnet. Härifrån kan du besöka vingårdar eller köra till små charmiga byar eller varför inte ta lokalbussen till Florens från närbelägna Greve in Chianti, för att ta några exempel. Eller att, som vi, komma hit för en akvarellkurs där den genuina atmosfären och det toskanska landskapet är inspirationen. Laura, och hennes personal, tar väl hand om oss och får alla att känna sig lite som hemma, fast borta. "A casa tua in Chianti""
"Des Réunionnais étaient de passage chez Laura et Filippo et ont profité d'un cadre merveilleux. L'accueil en "francais" et chaleureux de Laura nous a touché. Nous garderons en mémoire ce lieu, les personnes remarquables rencontrés, le paysage...merci aussi à Daniela et Valentina!" 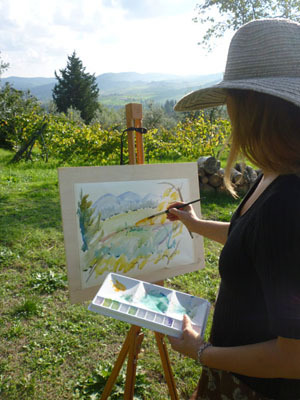 "Fabulous week painting the beautiful Tuscan landscape, eating wonderful food and drinking excellent wine all thanks to our lovely host Laura. Hope to be back next year. ???????????? — con Lynn Barrow e Marisa Andresco. " ""Stunning home away from home" This place seriously has a bit of a magic about it. It’s very rustic and charming and Laura was incredibly welcoming and made us feel Right at home. Great communal kitchen for cooking in the evenings and the room was very cosy. Laura provides lots of info in the rooms of where to go and things to do along with maps. Our daughter who is 2.5 met another family with kids and it was heartwarming watching them play all together in the beautiful grounds of the Bnb. I’d highly recommend this charming place to anyone who wants to experience to Tuscany and Tuscan hospitality."